(File pix) Council of Eminent Persons chairman Tun Daim Zainuddin says the present government is not going to waste the special dividend contributed by Petroliam Nasional Bhd (Petronas). 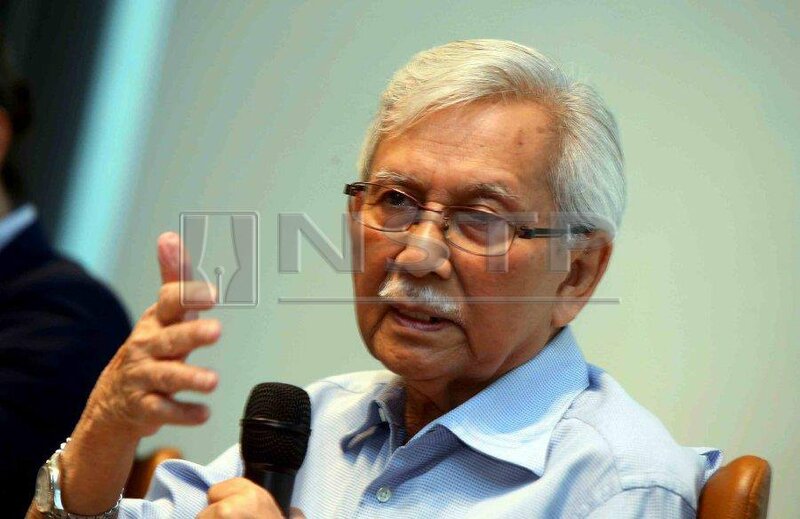 KUALA LUMPUR: International rating agencies have understood Malaysia's debt profile better following their meeting with Petroliam Nasional Bhd (Petronas), said Council of Eminent Persons chairman Tun Daim Zainuddin. “Petronas’ management had met up with the rating agencies which initially were fixed in their mindset. They now have a better understanding that Petronas can afford to pay this one-off special dividend. “The present government is not going to waste the special dividend contributed by Petronas. It will be pumped back into the economy,” Daim said. He was speaking to reporters after Deputy International Trade and Industry Minister Dr Ong Kian Ming delivered his keynote address at the Affin-Hwang Capital Conference Series 2018 here today. Daim was referring to Finance Minister Lim Guan Eng announcement in Parliament that Petronas would pay RM30 billion in special dividends to the government. Daim expressed his assurance that special dividend payout would not impede Petronas’ ability to service its corporate debts, fund ongoing operations and invest in future growth. “Petronas is a well-managed, Fortune 500 company. It has strong fundamentals and has the liquidity to make this one-off special dividend payout to the government,” Daim said. Prime Minister Tun Dr Mahathir Mohamad had earlier explained that Petronas can afford the special dividend contribution due to higher oil prices this year, compared to a year ago. Earlier this week, rating agency Moody’s had cautioned that Malaysia’s heightened reliance on “volatile” oil revenues in the short-term would weaken the nation’s fiscal profile. S&P Ratings too noted “heavier reliance on commodity-based revenues presents an additional risk to Malaysia’s fiscal accounts in the absence of more structural revenue-raising measures”. Last Friday, when tabling the 2019 Budget, Lim had also said Malaysia would be taking on Japanese bonds. The yen-denominated bonds, to be guaranteed by Japan Bank of International Cooperation at an indicative coupon rate of 0.65 per cent, are expected to be issued before March 2019. Dr Mahathir had explained the Japanese government's offer to guarantee 200 billion yen (RM7.4 billion) Samurai bonds with a 10-year tenure would be used to retire some of the costly loans taken by the previous government. “The indicative coupon rate of 0.65 per cent is favourable compared with the old debts which were pegged at a high repayment rate of up to 7 per cent,” Dr Mahathir had said.